The co-owners of Spartan Blades, in keeping with the company name, decided to call their 10 7/16-inch reverse-tanto sheepsfoot-bladed combat/utility knife, Hybris. Those familiar with Greek mythology might vaguely recall indirect reference to her hubris (over-inflated pride), insolence and arrogance. However, she is also the goddess of violence and outrageous behavior, necessary traits in elite warriors, no matter the era or place in which they fight. According to myth, she was the last among her peers to marry, so Polemus, the god of war and battle, married her. Clearly, an ideal christening for Spartan Blades Hybris Combat/Utility Knife. The 5 7/16-inch reverse-tanto sheepsfoot blade on the Spartan Blades Hybris Combat/Utility Knife is made with CPM S35VN steel with a black or earth finish. Handle comes in black or green canvas Micarta. MSRP: $330. Contact Curtis V. Iovito, Spartan Blades, LLC, 625 SE Service Road, Southern Pines, NC 28387; 910-757-0035, ciovito@spartanbladesusa.com, www.spartanbladesusa.com. Should you want to accessorize, Spartan Blades offers an appropriately warrior-looking line of beads in spartan helmet, skull with beret, shield and crusader cross designs, MSRP: $5-$10. However, there’s also a line of beads in sterling silver and bronze, including the exclusive-to-Spartan-Blades plumed spartan helmet, crafted by GD Studios in Latvia and exclusively imported by veteran-owned GD Skulls USA in Florida, MSRP: $98. Curtis Iovito and Mark Carey co-founded Spartan Blades in 2008. The two retired from U.S. Army Special Forces with over 40 years combined service. They prefer to focus on providing military personnel and outdoor enthusiasts with functional, durable knives, rather than chasing the latest innovations, which may or may not have staying power. They stick to using U.S. materials, and batches are small so that quality control can remain exacting. Accompanying sheaths are made by American- or U.S. veteran-owned businesses. At the BLADE Show® Spartan Blades’ Kranos framelock flipper model won the BLADE Magazine 2017 American Made Knife Of The Year®. Since Curtis and Mark taught at the U.S. Army Special Operations Command sniper school (Special Forces Sniper Course), they continue to support the school and USASOC International Sniper Competition. At one event, they ran into guest speaker Sebastian Gorka, intelligence analyst, best-selling author of “Defeating Jihad, The Winnable War” and now-former deputy assistant under President Donald J. Trump. American military and intelligence analyst, author of “Defeating Jihad, The Winnable War” and former deputy assistant to President Donald J. Trump, Sebastian Gorka (center), spoke at a U.S. Army Special Operations Command event attended by the co-owners of Spartan Blades, Curtis Iovito (right) and Mark Carey (left). An annual U.S. subscription to BLADE is $21.98. You can get your 13 issues sent to Canada for $39.98 and internationally for $49.98. Or go green and get your issues sent digitally for $17.98. 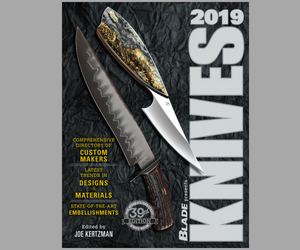 Each month BLADE Magazine features new knives from manufacturers and custom makers in its What’s New section. Be sure to subscribe so you don’t miss out. You can also read about some of them here on our website. Be sure to Like and Follow us on Facebook at BLADE Magazine.